The day of the tournament will kick off early. Here’s a projected schedule for the day, but please note that event details might change slightly as the tournament gets closer. 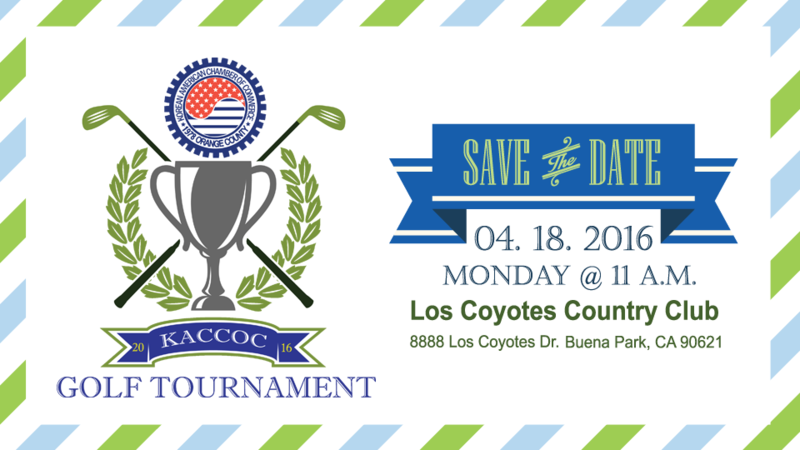 For more info call or email at 714.638.1440 or info@kaccoc.com. 이벤트 스케쥴은 행사당일 약간의 변동이 있을 수 있으니 유의하시고 궁금하신 점은 전화나 이메일을 통해 문의하시기 바랍니다. Get checked in early and get warmed up on the driving and putting range. Don’t miss out on the complimentary snack! The golfing will kick off with a shotgun start at 1:00 pm sharp! The tournament are scramble rules, best ball, $10,000 cash for “Hole-in-One” and there are several giveaways and contests throughout. Plus, every attendee at the event will be given a free golf club! 토너먼트는 오후1시 정각에 시작합니다. 홀인원 상금 $10,000과 참가자 전원에게 골프클럽 선물권을 증정 하는 등 다양한 상품이 준비되어 있습니다. The keynote speech, dinner and awards ceremony will commence after the winner is announced. See who will be this year’s champion! All of the raffle tickets will go into a bucket and be picked via the KACCOC board of directors to determine the winners of prizes. 저녁식사 및 시상식에 이어 추첨을 통해 푸짐한 상품을 나누어 드립니다. You can register for events requiring payment by clicking on the Eventbrite button below. 온라인 등록을 원하시는 분은 아래 버튼을 클릭하시고 Eventbrite 웹사이트에서 등록해 주세요. All scorecards must be turned in to the Tournament Director upon completion of the event. Men tee off from the blue tees and women from the red tees. Participants are responsible for providing their own golf clubs. All rules of etiquette and fair play should be adhered to. Players must wear a shirt with sleeves (No cut-offs, spandex or short shorts are permitted). No metal spikes or other footwear detrimental to turf quality are permitted. Teams will compete using a Callaway System. There will be a shotgun start (all teams start at the same time) at 1:00 pm. Each team (4 Players) will register upon arrival. 4인 1조 팀별로 도착하시는대로 등록해 주시기 바랍니다. 샷건 방식으로 오후 1시에 시작합니다. 채점방식은 칼라웨이 핸디캡 시스템을 적용합니다. 금속 스파이크 등 그린을 훼손시킬 위험이 있는 골프화는 착용을 금지합니다. 복장은 칼라와 소매가 달린 셔츠를 기본으로 합니다(민소매/짧은 스판덱스 바지등 착용금지). 경기 시 에티켓과 페어 플레이를 준수해 주시기 바랍니다. 참가자는 자신의 골프 클럽을 가져오셔야 합니다. 남자들은 블루 티에서, 여자들은 레드 티에서 티오프 합니다. 경기 종료 후 모든 스코어보드는 집행부에 제출해 주십시오. ‘SUMMER’ rules are in effect at all times (i.e., you may not touch your ball once played from the tee until it reaches the putting surface of the hole being played). In stroke play, you must hole out in order to have a score. Participants may enter multiple competitions however one player is only allowed one prize. Golf instructors or Teaching pros are not allowed to accept prize except the hole-in-one prize. Double par is the maximum score on any given hole. Please waive up the next group on par 3’s. If a ball is lost or out of bounds, the player must play a ball, under penalty of two strokes, and one stroke for the hazard. Teaching Pro나 Golf 교습하시는 분들은 시상에서 제외되나 홀인원은 수상하실 수 있습니다. Double Par가 Maximum이며 그 이상은 Count하지 않습니다. Par 3 Hole은 필히 뒷 팀에게 웨이브를 주십시오. O.B.나 Lost Ball은 2타 벌타이고 Hazard는 1타 벌타입니다.